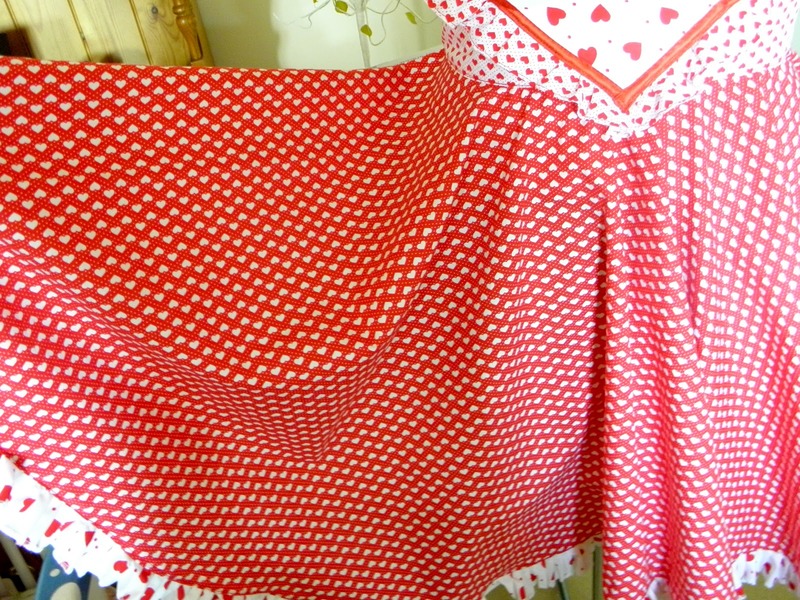 I adore charity shops, not only do they suit my budget, but I find they are teeming with things that inspire me. Take this little lovely basket, I admit now that I have a wicker fetish I simply love them and have many baskets in all shapes and forms. I think it is the tactile nature of them, similar to wood it has a living appeal. I think this basket harps back to either fifties or forties, the colours seem to be right and someone has taken good care of it so I wanted to re-vamp it in tune with its nature. 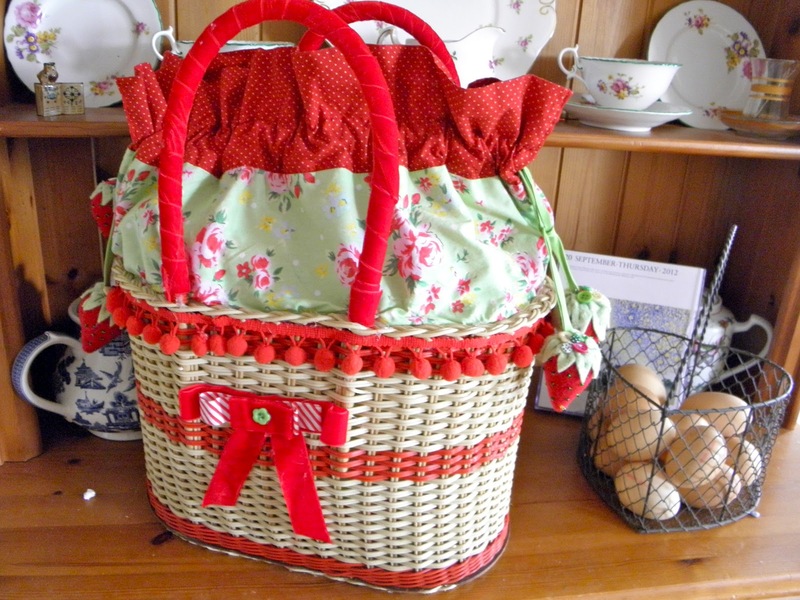 I made an inner bag using vintage style Kath Kidstonesque fabric from Fabricland. I love the combination of reds and greens, who says they should never be seen eh? It makes the basket a little more useful as I can keep my purse in it and not have it on show while I am shopping. 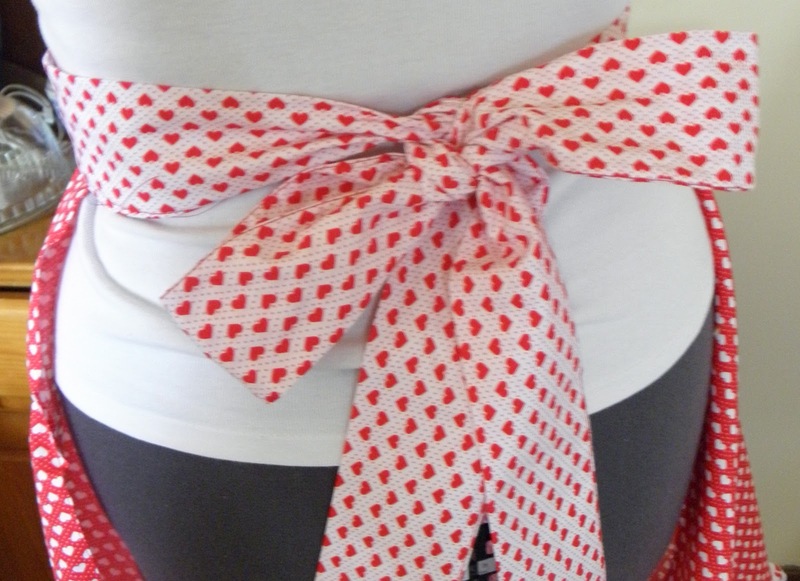 I made the little bow on the side to match my stripy fifties dress I was wearing to Goodwood revival. 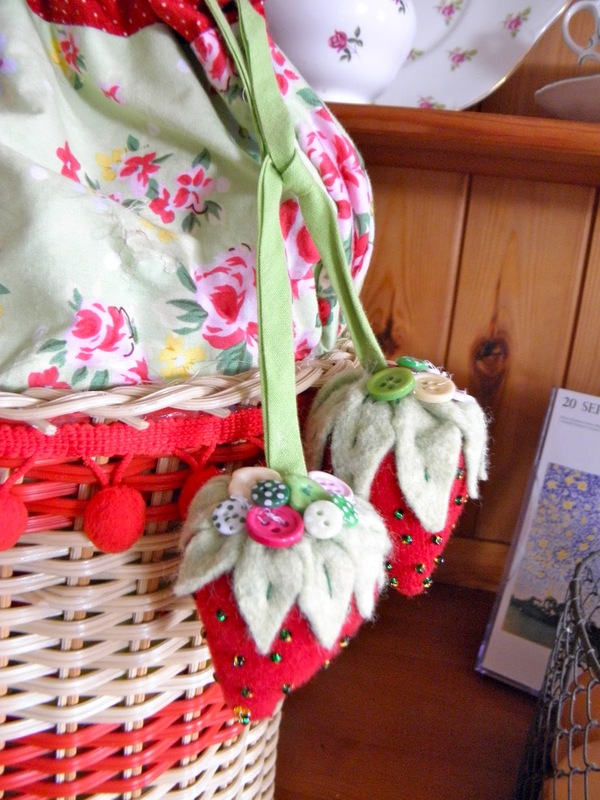 This bag has been admired where ever I go, especially the pretty little drawstring strawberries. 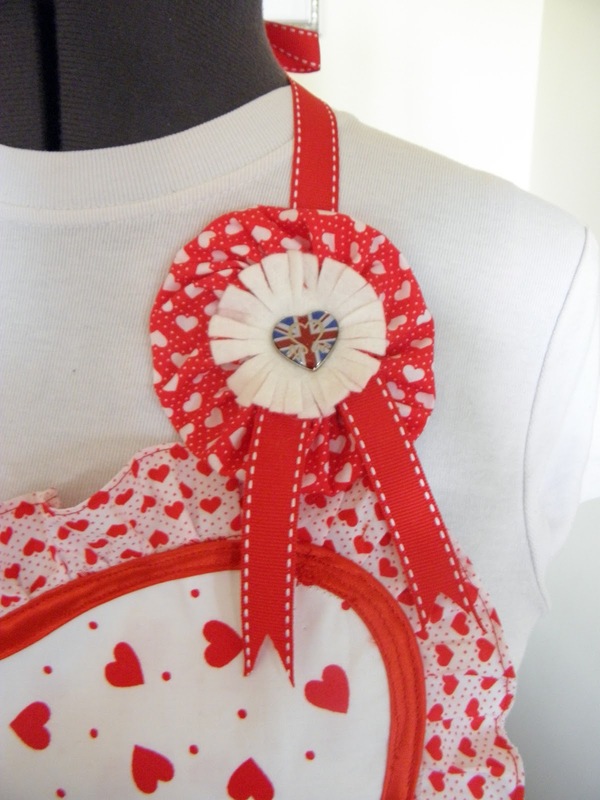 I could not resist adding the bobble ribbon round the rim, and the strawberries were fun to do which was a good job because the day I finished it someone’s dog chewed one off! They are hand stitched and it always surprises me how relaxing hand sewing can be. 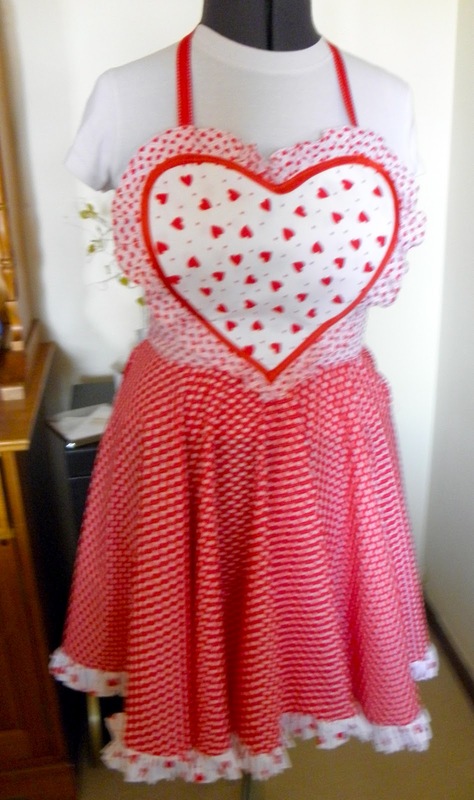 I used some red suiting I had left over and some green felt that I had made from an old blanket. I also filled the strawberries with some rice to give them a little weight. The buttons are from a new range Tilda has brought out they are designed for scrapbooking, but they were perfect for this because they are so tiny! As with all things the project grew a little, I glue gunned the edge of the liner to the basket to fix it in place otherwise it would constantly sag. 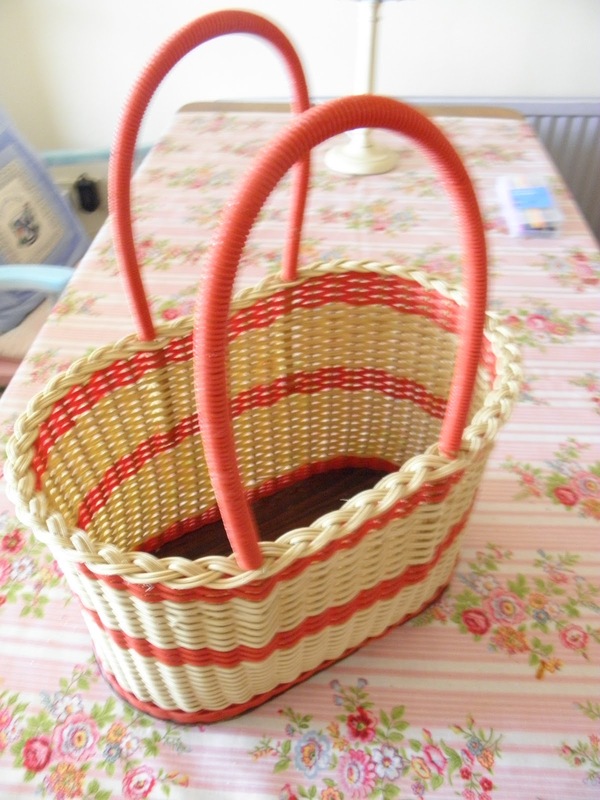 I also added lovely velvet ribbon round the handles as I found the handles cut in when the basket was full. I love it, especially shopping with it it is so pretty. If you would like to make some strawberries of your own, leave your email address in the comments box and I will send it to you.